I'm warning you guys... This post is gonna make you super hungry! You can see me rave about their Beef Sukiyaki here. For a period of time I was like seriously addicted to it and had to eat it like once a week! After that they came out with a special item called the "Thick Steak" and it was so good I seriously smsed all my beef lover friends to go give it a try. 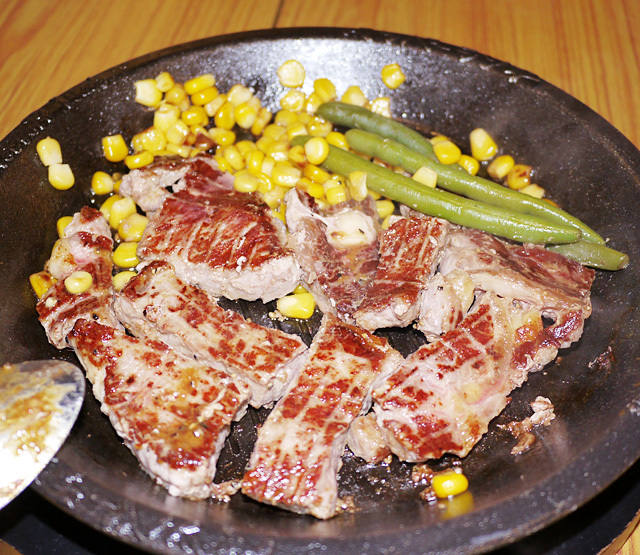 The thick steak was just like the Pepper Steak but super thick, like a tenderloin! At only $15.90 it was just the most value for money good steak I've ever had. 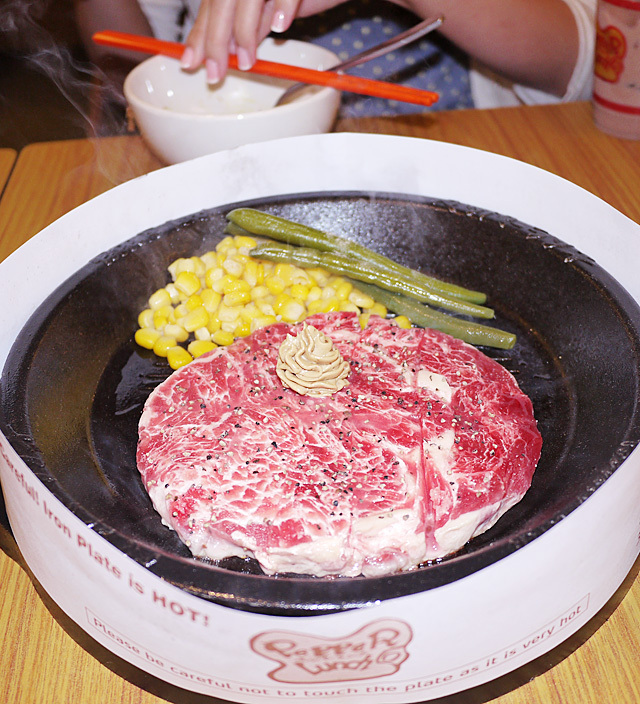 Too bad this item is no longer available but the Pepper Steak and Rib Eye Steak are very, very close. 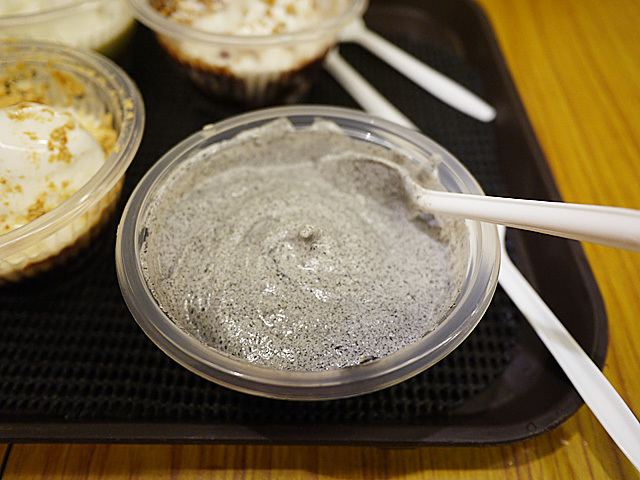 And some of my tweets about Pepper Lunch: Here, here and here. Section closed just for me and my friends. Invited Qiuqiu and Kaykay to gorge with me. Drinks first: I had my favourite Iced Mango Peach and Qiu chose Iced Milo (as did Kaykay). 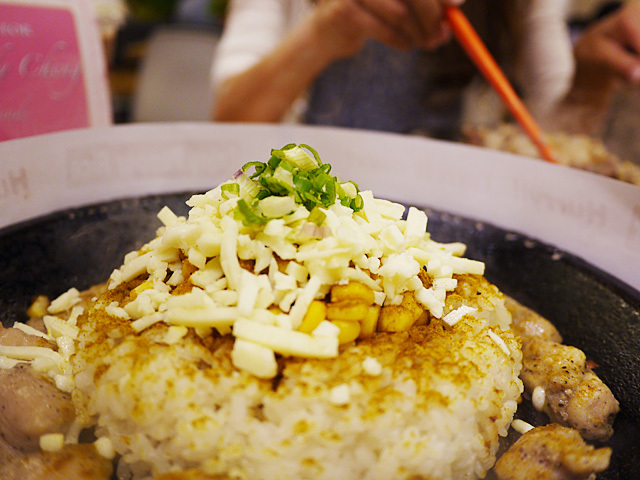 Curry Chicken Pepper Rice with Cheese! 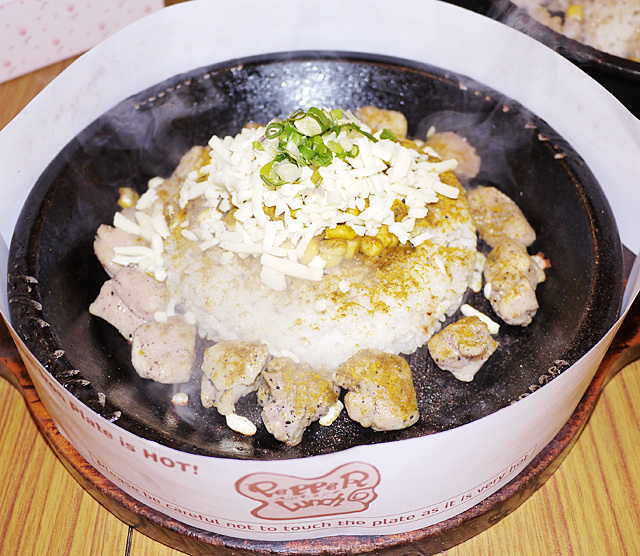 Generous pieces of chicken thigh seasoned with flavourful curry powder and rice with corn and generous slices of cheese atop it... All sizzling on a hot plate. 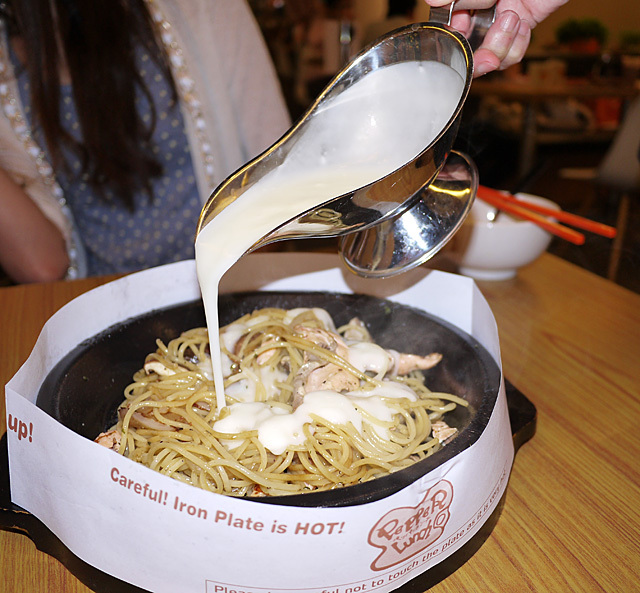 When the cheese is melted it is HEAVEN! Look at the strands of cheesy goodness. OMG... 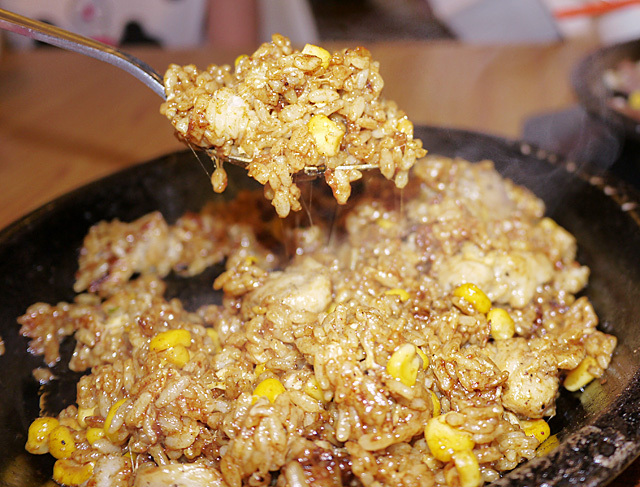 The rice is sticky and gooey with a really special curry flavouring. Spicy without being overpowering. Us girls just attacked the plate till nothing was left. 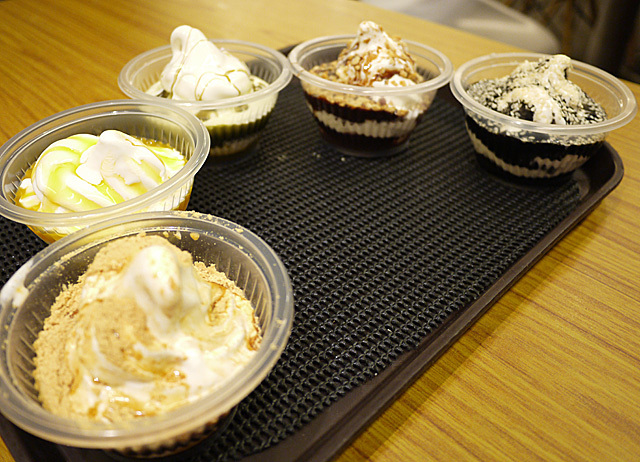 One more awesome thing about Pepper Lunch? You can feel free to do add-ons to your meal!! Not enough corn/bean sprouts/cabbage/beans? Another serving is just 30c!! Adding cheese? 90c. Adding an egg is $0.50. And guess how much this dish cost? $9.90! In the background you can see the Beef Pepper Rice too. Not gonna blog much about it as I think most of you have possibly tried it before. 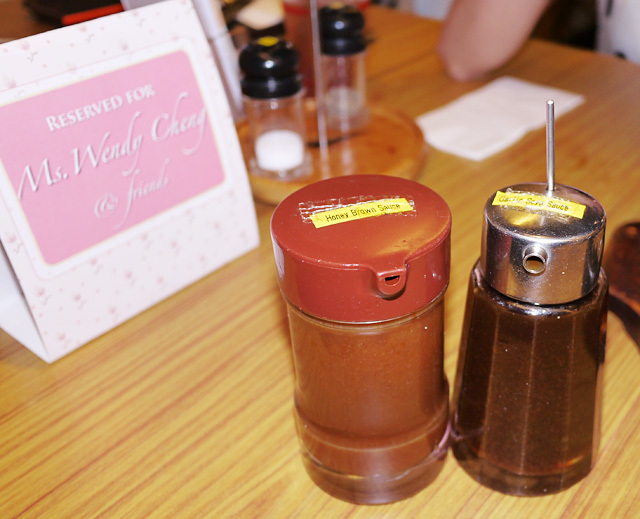 The Honey Brown Sauce and Garlic Soy Sauce are the essential sidekicks to Pepper Lunch's food! I love a combination of the two and I love DRENCHING my food with the sauces. By drench I really mean pouring the sauces full blast for about 5 seconds each. The sauces particularly go well with the steaks, and would you look at that steak? You can hardly believe that such a large well marbled piece of beef can go for just $16.90 - the Rib Eye Steak is super value for money (comes with mashed potato too). This is my favourite dish of the evening! Qiu doesn't take beef so Kaykay and I finished it all. Even cooked medium well the beef is extremely tender and melts in your mouth. 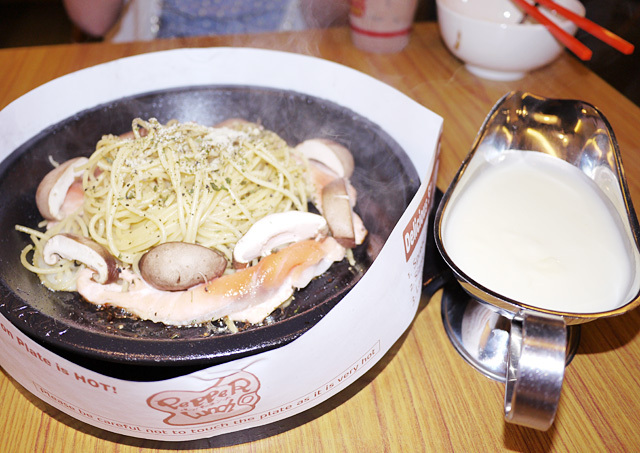 Next up is the Salmon Cream Pasta with Mushroom ($11.90). 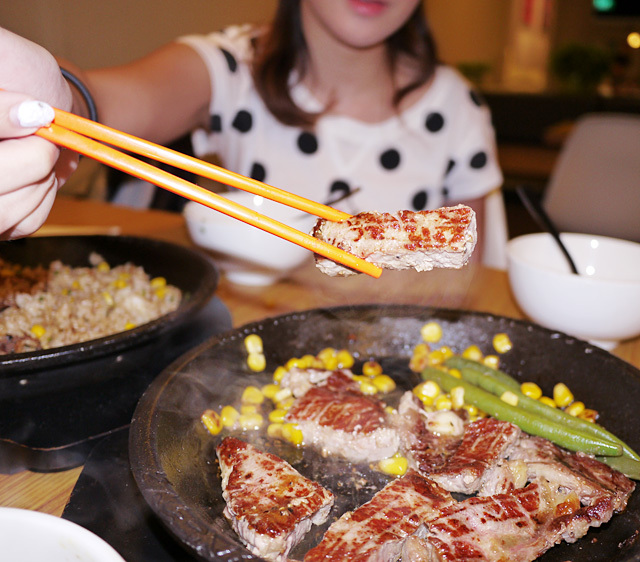 A lot of people think Pepper Lunch offers just beef or rice which some people do not eat. 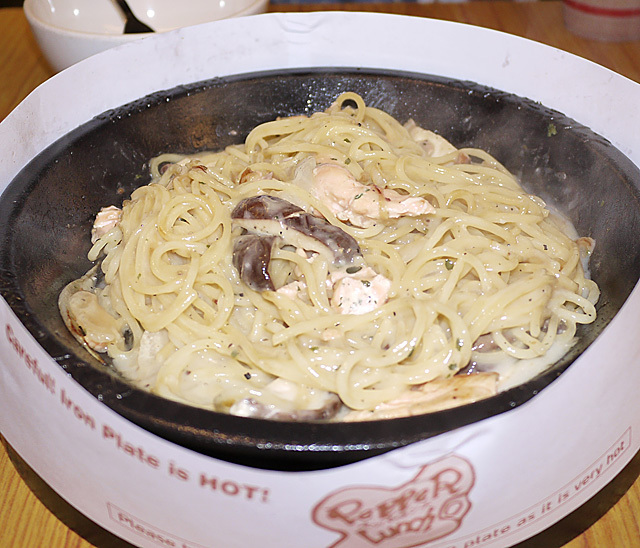 But they cannot be more wrong as there is a huge selection of pastas and other different meats! That's right you can request for tableside cooking too if you don't trust your own cooking skills! Pour the cream sauce in. At $13.90 this dish sure contains a lot of yummy stuff!! 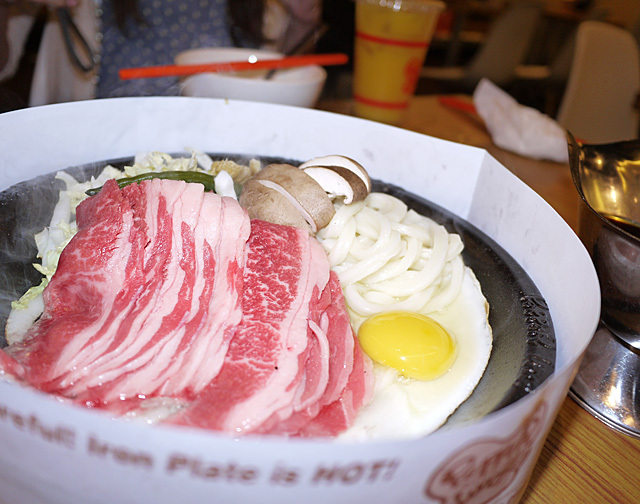 On the hot plate are chunks of fine marbled beef that melts in your mouth, cabbage and onion slices, an egg, udon, tofu, mushrooms and beans. I was told that this dish is "improved" and the sauce is changed. I was really apprehensive because seriously I liked it fine the way it was. But guess what? It's actually nicer now wtf!! They somehow made the sauce a little less salty and more watery. It used to be just a little too thick and strong so now it's perfect! I cannot describe how much I love the sauce!! After it's cooked together with the cabbage it just has this sweet flavour to it that goes perfectly with a slice of quality beef. MmmmmMmmmm! 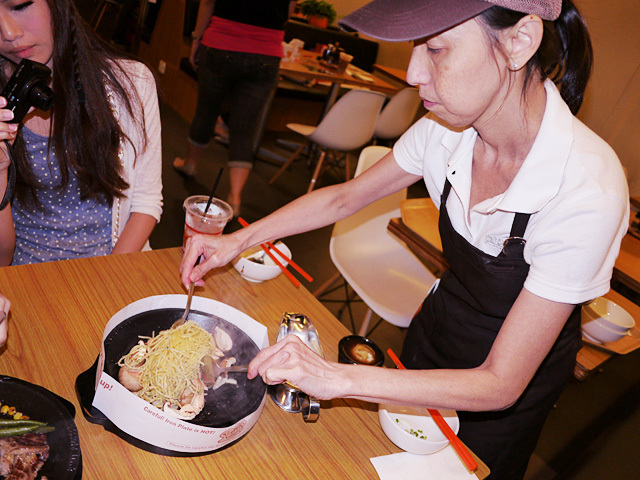 The slippery udon quantity also increased so udon lovers would be pleased. Kaykay and I devouring it. Sipped every last bit of the broth! 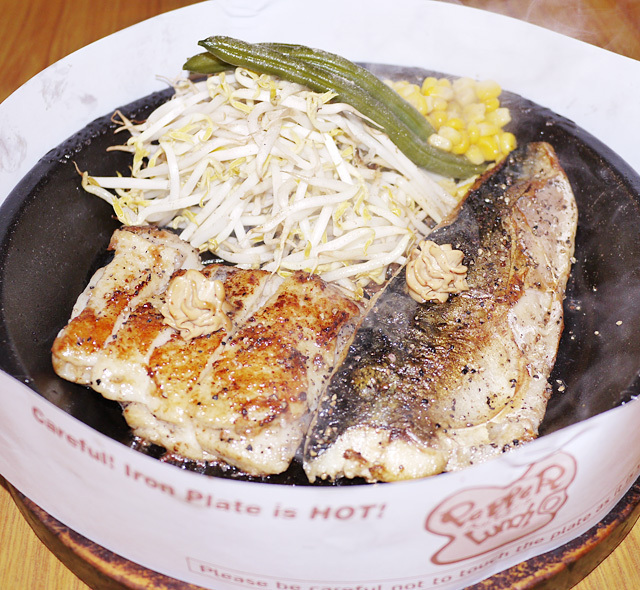 I thought it was really adventurous of Pepper Lunch to try serving saba as it is not a very "common" fish. However, it's delicious! The saba is a premium grade imported from Norway. 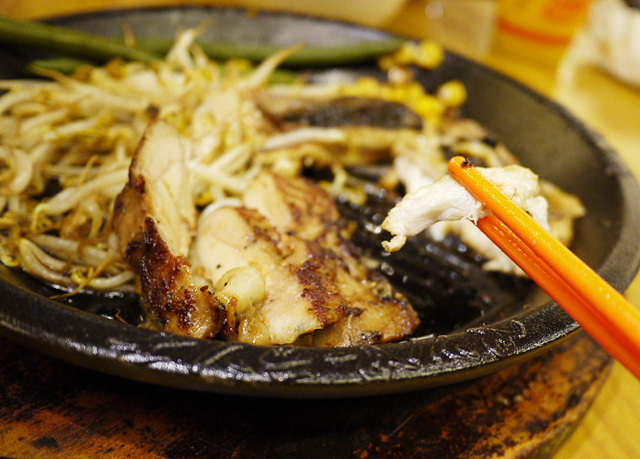 Juicy and goes really well with the garlic soy sauce. 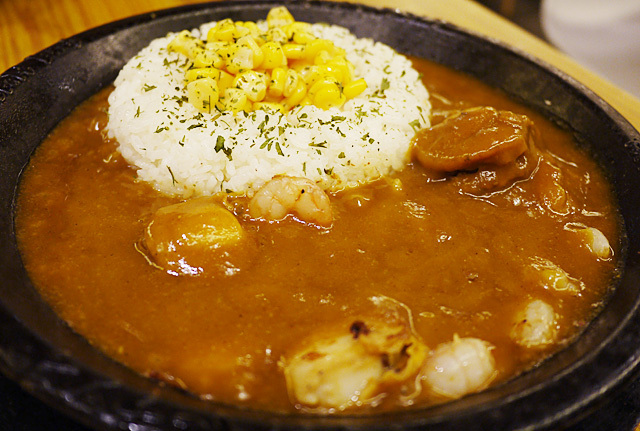 Curry Rice with Seafood, with Beef and Hamburg Steak or with Chicken and Mushroom. Hello big scallop!! You are welcome in my belly! A lot of people would think the correct way to cook this is to pour the curry in and mix everything up but technically the correct way is to saute the seafood, then pour the curry around the rice. That way you can gauge how much curry you want with each spoonful of rice! Traditional Japanese curry is sweet and mild but the new trend is to have curries that are tasty and rich with a spicy kick. 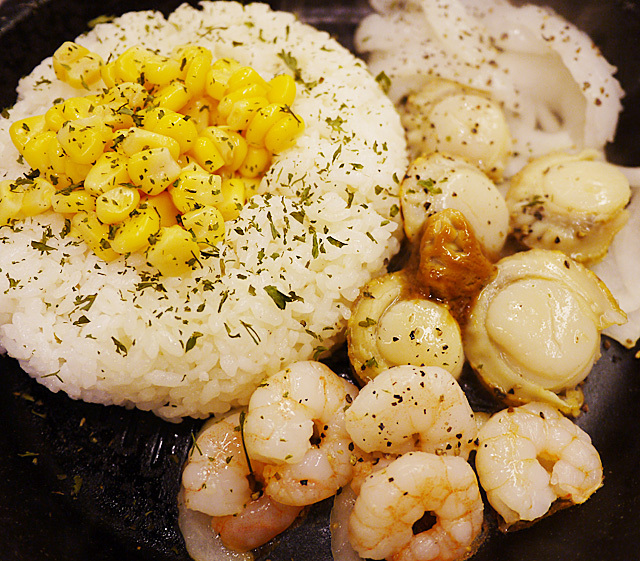 Combined with the freshly cooked flavour of the seafood this is really quite yummy! The passion fruit is a new addition! 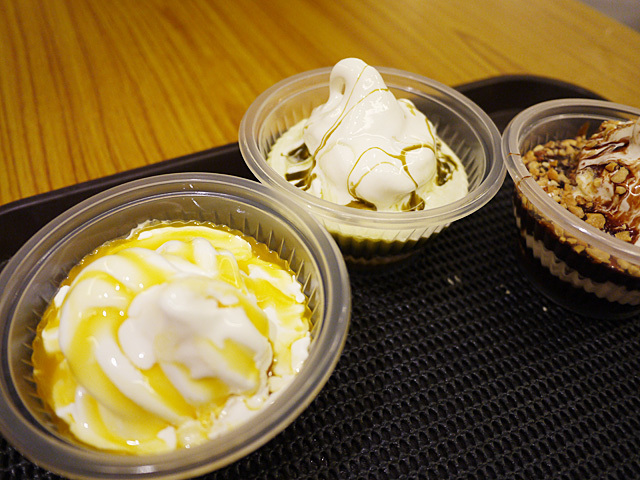 It offers a much need variety to the available ice creams because it is the only sour, tangy one while the others are sweet. I liked it! The Matcha used to be the worst among the ice creams when there were only 3 flavours available (other 2 being goma and kuromitsu). However, it is now improved and I can safely say it is putting up a good fight!! Kaykay's favourite is the matcha! Very refreshing and clean-tasting. My personal favourite is either the Kuromitsu (also this is Qiu's favourite) or the Goma!! 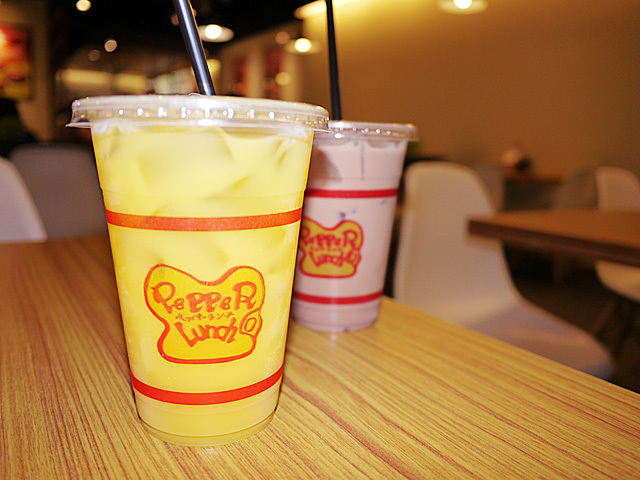 Feeling like some Pepper Lunch? Want it even cheaper than usual? Very simple! Just click "Like" on Pepper Lunch's facebook page and print out the relevant voucher, or store it in your phone!! Have fun cooking and eating!